Sabira Merchant has met hundreds of girls over the years while training them for the Miss India and then the Miss World and Miss Universe pageants. But she remembers working with Priyanka Chopra and Lara Dutta very well. The sessions included speech and diction training, where contestants were taught to read loudly from books and magazines so they could feel confident about facing an audience and projecting their voices. Priyanka had spent her teenage years in the US. And she had naturally acquired an American accent at the schools where she studied. “It was an honest American accent which she had picked up naturally," Merchant says while speaking to me about training the contestants. “Nothing was put on. When you are that young, you are impressionable and you pick up the accent you are hearing all around you." But knocking out Priyanka’s American accent became quite a challenge for Merchant. “She had that kind of a nasal twang. I told her if she was going to represent India, she could not come across as a Yankee-sounding person. You have to sound Indian in front of the crowd or at least you should get a global English accent and not American English." And Priyanka worked hard at it. At that time Merchant was teaching at Mumbai’s SNDT University and she recalls Priyanka even following her there. “And I would be like, ‘Now Priyanka we have done enough work. You can relax, you are okay.’ And she would say, ‘No, no, just one more question.’ She was so bent on improving herself. She was so keen that it was just unbelievable." But Merchant also found Priyanka a bit childish, not unusual for an excited teenager. “She was always rushing into things," Merchant says. In comparison, Lara Dutta was always very mature and had a natural, yet modulated voice. One reason could be that Lara was already 21 years old in the fall of 1999, while Priyanka was just 17. “She (Lara) spoke very well. And she had the gift of the gab. Her vocabulary and choice of words was excellent. I worked very little with her, just to teach her not to do certain things." That year, the Miss India contest was held in Pune at the Poona Club. The date was 15 January 2000. The contestants faced a range of celebrity judges—actors Shah Rukh Khan, Juhi Chawla and Waheeda Rehman; cricketer Mohammed Azharuddin; media mogul and film producer Pritish Nandy; painter Anjolie Ela Menon, the then founder-chairman of Zee Media (and now Rajya Sabha MP) Subhash Chandra (Goel); fashion designer and perfume queen Carolina Herrera; and Marcus Swarovski, the great-great-grand nephew of the founder of the Austrian crystal company. The same report said that Shah Rukh Khan asked a question of another contestant. The report failed to mention that the contestant was Priyanka Chopra. But then again, Priyanka was just a regular contestant at that time, not the star she is now. There is a YouTube video of the classic moment—17-year-old Priyanka wearing a leather jacket (all contestants dressed alike for this round, and their clothes for the day of the pageant were provided by the organizers), with her hair open, facing Khan who was already a huge star then, having acted in films such as Dilwale Dulhaniya Le Jayenge (1995), Kuch Kuch Hota Hai (1998), Dil Se (1998), Karan Arjun (1995) and so many more hits. Shah Rukh started his long question by saying, “I am as nervous as you are, I go meek in the presence of beauty.’ And then, he posed the long question, ‘Hypothetically, if you were to marry one of the following, who will it be? An Indian sportsman, like Azhar bhai—who would take you all around the world, make your country proud and make you swell with pride. Or an artistic businessman with a difficult name to pronounce like Swarovski, who would bedeck you with jewels and fine necklaces and you would never have to buy a chandelier for your house ever again. Or a Hindi film star like me, who has nothing better to do than to give you a complicated multiple-choice question about a hypothetical wedding like this." Then he added, “And before you answer, let me tell you, whatever your answer is, none of it will prejudice my marks for you. I am sure Azhar Bhai and Swarovski won’t mind." Priyanka kept a smile on her face, trying hard not to show any signs of nervousness. A girl from Bareilly was suddenly talking to Shah Rukh Khan in public. She held her breath, thought quickly and responded, “If I was to choose one of these three very difficult choices, I think I would go to a great Indian sportsman." People cheered, and Priyanka continued, “Because when I come back home, or when he comes back home, I know I will be there to be his support to tell him I am proud of him, just as India is. To be able to tell him, ‘Hey look, you did your best and you are the best,’ and I will take immense pride in my husband who will be a man of strong character if he can bring so much pride to my country. Thank you very much." 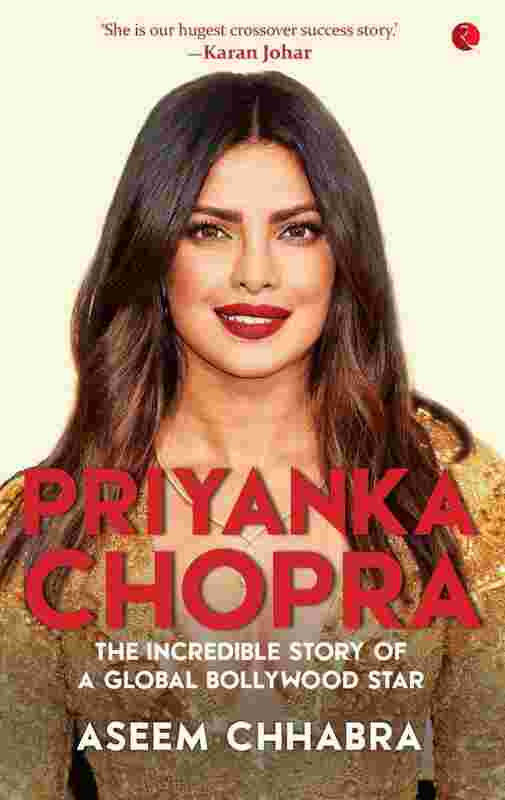 Priyanka Chopra: The Incredible Story of a Global Bollywood Star, By Aseem Chhabra, Rupa Publications, Rs500.